How Do You Know You Have A Good Office Cleaner? Home > Blog > How Do You Know You Have A Good Office Cleaner? If you are an office or facilities manager, you know the pain of trying to find and keep a good office cleaner. There are so many cleaning companies out there promising the world, but how do you know which one is best for your office? Are they fulfilling their requirements, or are corners being cut? We’ll share our top 5 tips to help you find out if your office cleaner is a good one! It’s surprising just how many facilities managers don’t do this. Depending on the size of the office, the schedule could be pretty detailed, but every week or month pick just one thing to spot check. For example; check the recycling bins are being collected and disposed of correctly, or check when the glass should be cleaned. Choosing just one thing to check doesn’t take too much time and your cleaner, if they are a good one, will be doing what they should! Does your office cleaner sign in before they start work? If they don’t and you are worried you aren’t getting a top cleaning job, get your cleaner to sign in and out. That way you will see if they are on site for as long as they are meant to be. After all, you are paying for their hours, so you want to ensure you are getting value! Does Your Cleaning Supervisor Communicate? A good office cleaner will be seeking feedback and keeping you updated on staff changes and the cleaning schedule. You will likely be paying for a cleaning supervisor as part of your contract, so you should expect some regular meetings and calls from the cleaning company. If you don’t even know who your cleaning supervisor is, or only speak to them when you call them with a problem, it could be a sign that your cleaner is not interested in you and underperforming in other areas. How Well Does Your Office Cleaner Treat Their Staff? If your office cleaner seems to change every week, it’s a big red flag that there is a problem with the training, pay and culture of that company. As for proof that your office cleaners have valid working rights in Australia, and that they are paid at least the award rate. If your cleaner looks sad or stressed, it could mean they are overworked and underpaid. A happy human is a harder working and more engaged human. Cheapest doesn’t always mean the best deal in the long run and it pays to work with a commercial cleaner who values their workers. Does Your Cleaner Go Over And Above? A cleaner who reports back issues in the office or one that just does that little bit extra is one you should value and keep. If you notice that these extras are being done, a thank you to your office cleaner goes a really long way. It shows that they are engaged at work and actively looking at ways to make things better. If the extras become regular items to clean, this can end up as a fixture on your cleaning schedule and little by little your office cleaning game will improve. Good office cleaners are hard to find. So, if you have one, make sure you say thanks and pass on your appreciation as cleaners work incredibly hard behind the scenes to ensure your office is clean and fresh every morning when you arrive at work and pop your coffee on your desk to start your day. 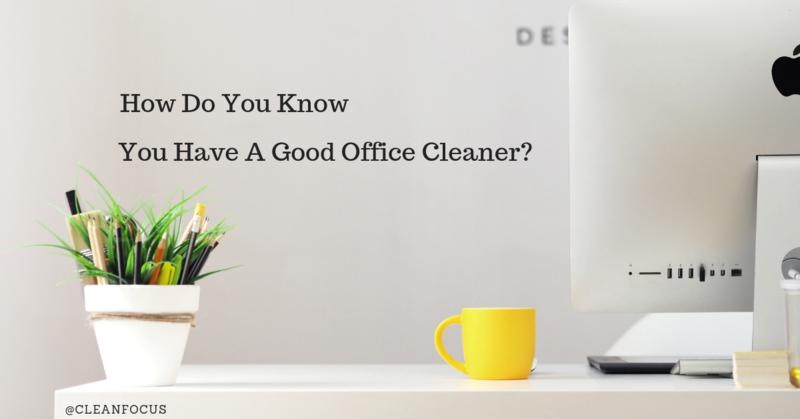 Share the ways you can tell you have a good office cleaner in the comments below!